Here’s a Question: How much lack of civility and decency must a person have to drive around brandishing their vehicle as a weapon to intimidate someone — or in our case a couple — whom they know nothing about out riding a bicycle on a public road in accordance with the law? If you’re a cyclist, you’ll fully appreciate the answer to that question. But, if you’re not a cyclist who has to live through this experience almost every time you ride on a public road, you’ll likely think I’m being over-sensitive or worse yet, take the point of view of the motorist who truly doesn’t think they should have to share the road with cyclists or give them the legally required, 3-foot safety distance, when passing. And, here’s the rub with that: a lot of the motorists who are “triggered” by the presence of a cyclist on the road are otherwise good and descent people who would likely do everything they could do avoid hitting an animal that ran into the road. Yet, a few of these same motorists see a cyclist as a target where their goal is trying to get as close as possible to communicate their ill-conceived sense of entitlement to a road free of cyclists and — most likely — pedestrians as well who are willing to inflict emotional harm as well as the risk of physical harm to a fellow human. Let that sink in… and apply it to just about every other situation where you can’t understand why people act they way they do. We were out on the tandem this past Saturday enjoying what of late has been a rare day when the sun was shining and the temperature was in the 60’s. Sadly, it was in the afternoon so we had to deal with a lot of motorists on the back roads around our home. At one point there was a back-up of cars behind us where the lead motorist was more inclined to be patient and wait until it was safe to pass and behind him was another motorist who was clearly not patient, blowing his horn and what not. Once the cautious motorist reached a point in the road where he could safely pass and give us the legally required 3-foot clear safety margin, he did so… and right behind him was “the other guy” in his white Mazda RX-8 who had been blowing his horn and who felt inclined to “buzz us” as he passed. But, as he passed he confirmed my suspicions about driver’s like this: they truly want to try to intimidate cyclists with their cars and prove it by watching the just passed cyclists in their rearview mirrors to see if it had the desired-effect, i.e., did he successfully shock, surprise or agitate the cyclists? You can easily confirm this by doing just about anything to visibly acknowledge the driver did, in fact, shock, surprise or piss you off as it will invariably yield a flip-off by the driver who is now well past you. Yup, there’s nothing like watching a driver who is so filled with intolerance and anger when sitting behind the wheel of a car that they look for confirmation that you — as a cyclist — know they would do you harm with their car if they thought they could get away with it. But, short of that, they’ll come as close as they can and then look for the feedback that they accomplished their small-minded goal of letting you know they don’t think you should be on their road. Walt Disney released a Goofy Cartoon back in 1950 entitled “Motor Mania” that captures this very transformation of good people into something less than good people as soon as they get behind the wheel of a vehicle. Truth be told, the same thing happens when people put any kind of weapon in their hands: they become emboldened by the sense of power they suddenly have at their fingertips and their actions change accordingly once they are “triggered” to act with that altered state of perceived power & control. This entry was posted in Advocacy & Access. Bookmark the permalink. 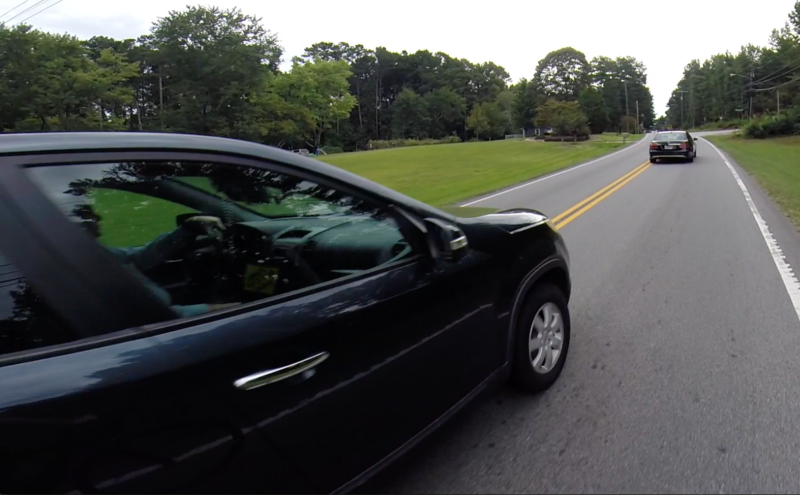 1 Response to Motorists… Don’t Be That Guy! Mark, we live in a small community and for the most part do not experience the kind of issues you describe. It seems like the situation has gotten to the point that riding is more stressful than relaxing. Maybe now that you are both retired you might consider moving to another area with less traffic.